Point of brush and watercolor, heightened with gouache, on paper. Purchased as the gift of Mrs. Charles Wrightsman. Signed and dated at lower left in pen and black ink, "Louis Belanger 1782". Inscribed in pen at lower right, "Belanger delineavit Lon(dres)". Old mount bears the inscription, "Vue de l'entrě du Pic de Darby/Ct̥ ̌du village". Collection L..., Paris (formed at the end of the nineteenth century); Galerie Cailleux, Paris. Watermark: none visible through lining. Less well-known than his elder brother François-Joseph Bélanger (1744-1818), the noted architect and landscape gardener, the landscapist Louis Bélanger traveled in France in 1779, and in the Alps, Savoy, Switzerland and Italy in 1780. The present drawing is proof of his first trip to England in 1782 before his stay in this country during the Revolution. He later returned to England in 1790 where he met great success, and exhibited at the Royal Academy. By 1798 he was in Stockholm and was appointed First Painter to Gustaf IV Adolf, King of Sweden, (1792-1837). 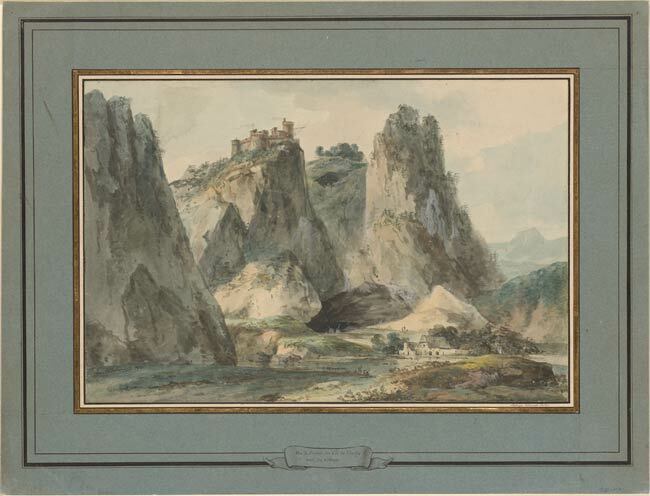 His brother, François-Joseph executed at least two other views of the Cliffs of Derby which came from the same private collection as the Library's drawing. One of these bears an inscription: "dessiné en Angleterre par Bélanger Architecte le 11 mars 1766". François-Joseph Bélanger was Architecte des Menus-Plaisirs du Roi and at this period, he was invited to England by Lord Shelbourne. The Ecole des Beaux-Arts in Paris preserves several drawings by him representing Lord Scarsdale's gardens and houses, some of them near to Derby (see J. Stern, "François Joseph Bélanger, Architecte des Menus-Plaisirs", Paris, 1930, vol. 1, p. 4-5).